I’m known for my OM’s! People comment on the length and intensity all the time. I attribute my lung capacity to pranayama, a conscious breath practice that I whole heartedly believe in and have studied exclusively with a teacher. I attribute my interest in pranayama on my early experimental use of drugs. Whether it was a trick I learned to open up bigger passage ways of air stream or the grounding ability of breath that has helped me through unfortunate instances of taking too much, I learned the importance of this life force early on my path and as much as it feels taboo to admit – it all started with marijuana. Now drugs have an ability to connect you to consciousness but they will not keep you there. Many lives have been lost trying to chase the feeling of interconnectedness and euphoria that you can achieve from outside sources. Finding true samadhi (bliss) for the long-haul takes persistent practice and clarity only found from inside understanding. In this world of external stimulus we must not be fooled that any of that can create lasting peace within. In fact, it tends to create dependency or worse, addiction. Concurrently, in this world of extreme distraction, ever increasing ailments and a disconnect to nature; cannabis seems to be on the forefront of miracle medicine helping humans to navigate diseases and decrease the number one cause of them… stress. With an array of options in today’s world I would find it hard pressed to come along an entire yoga class where none of the participants were under some kind of chemical influence (including medications, caffeine, antihistamines, pain relievers, etc). Cannabis Sativa is indigenous to India (the birthplace of yoga), so it makes sense to wonder if maybe there’s some connection there. In India, the country’s sadhus (a holy person, sage, or ascetic) have long been known to smoke hashish as part of their spiritual practice. I’ve even seen it argued that Shiva (the founder of yoga) was partial to the herb. I’ve personally smoked marijuana before an uncountable amount of yoga classes I’ve practiced in and find it a strong enhancer of inward focus, mind/body connection, and ease of relaxation. In fact, after an occasional smoke, I’m often prompted into a home practice guided very intuitively by what I feel. Now, I’ve never smoked marijuana before teaching (“um, what side were we on?”) because I do believe in the clarity of being a conduit for others. One of the ways I am called to share as a teacher though, is to offer a weekly cannabis inspired class in a space where plants and plant medicine are the focus… a tea shop! 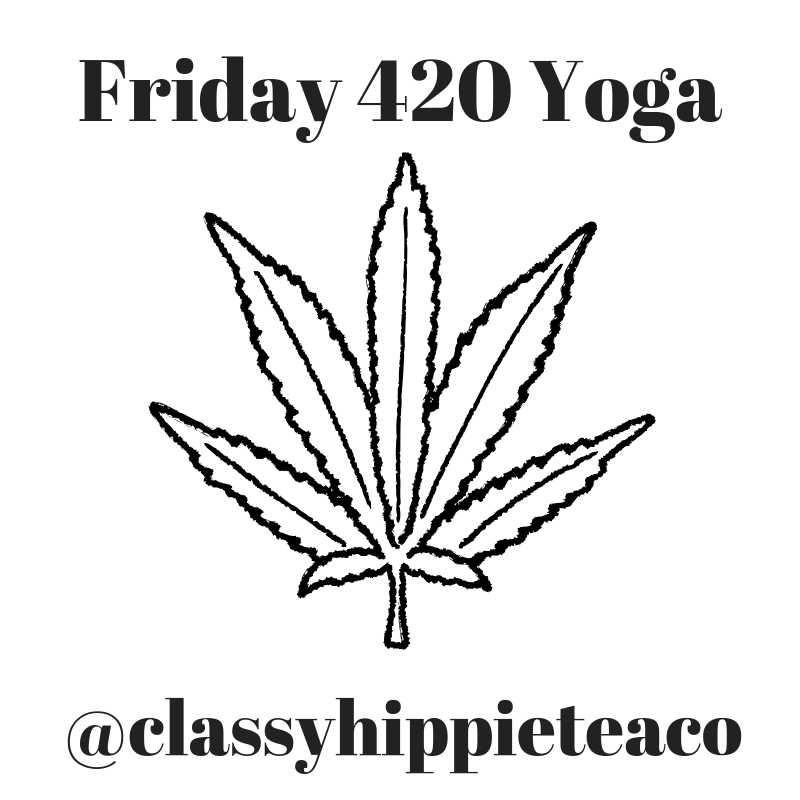 I’m partnering with Classy Hippie Tea Co. in Oak Park for a Friday 420 class. Beginning on February 22nd and every Friday following, show up to the tea shop around 4pm. We’ll begin an easy hatha flow at 4:20pm and end at 5:30pm. While marijuana is now legal for recreational use in California, Classy Hippie Tea Co. is not providing cannabis (nor I) and it is still illegal to use in public spaces. Please arrive having consumed your own smoke, edible, or topical application (keeping in mind how you’re getting to/from) and enjoy an ease into your weekend. Drop-in rate for class is $15. Members of the tea shop get 20% off and free tea! Tea is available before and after class. Every Friday the Vegan Van sells an amazing vegan dish at the shop to enjoy there or to take home and beginning in March there will be live music following class at 6pm.